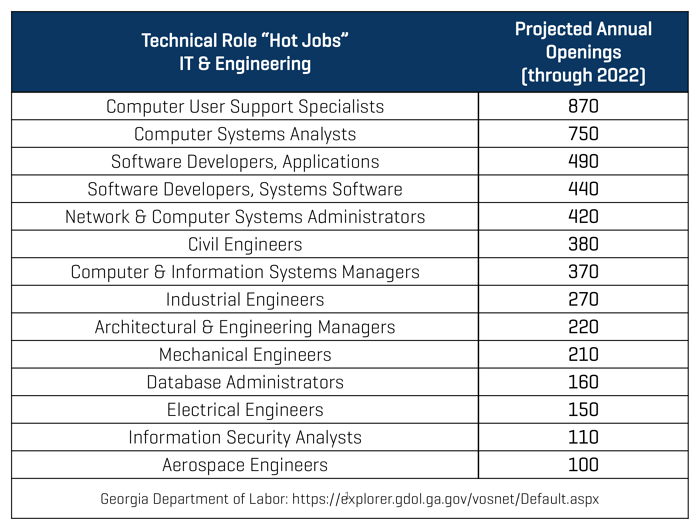 With a low cost of living and growing technology sector, the Atlanta job market is booming, especially in technical fields such as IT and engineering. This is great news for job seekers, but what about Atlanta organizations competing to recruit and retain these technical professionals? At Performex, we partner with innovation-driven organizations to provide leadership development and talent management services for technical professionals. In speaking with the executives and Human Resources leaders we serve, one of the top concerns they share is the recruitment and retention of technical talent. With the ongoing war for technical talent, we found it as no surprise that fourteen of the “hot jobs” were in the fields of IT and engineering. Their specialized skill sets are in high demand in the Atlanta job market and across the nation. Further, we found that both IT and engineering managers were listed among the hot jobs. Facing significant needs for talent at individual contributor and management levels, innovation-driven organizations must find solutions for attracting, engaging, retaining and developing their technical talent in order to survive. What talent management strategies do you employ within your organization? Do you engage and reward employees by promoting from within? If so, how do you select which IT professional will become the next IT manager? Is he/she selected due to outstanding communication and leadership skills, or is the decision based on technical knowledge and expertise? We conducted a study of 250 executives leading innovation-driven organizations. We polled the leaders regarding their talent management challenges, needs and development plans. We found that 92% of executives select candidates for promotion based on demonstrated expertise in their areas. Only 28% of executives polled considered demonstrated leadership skills as one of the most important factors in determining promotability. This mindset is extremely common, and it often results in challenges when individual contributors are moved into management roles without developing the critical skills they need as leaders. In addition, the unique mindset of technical professionals – including those working in IT and engineering fields – requires a unique approach to development. A one-size-fits-all approach is not effective for these specialists. A proven, process-oriented approach is key to gaining their buy-in. 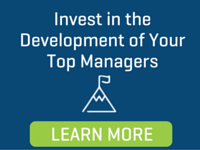 Offering open-enrollment development opportunities such as the Summit Leadership Excellence Programand onsite, custom workshops tailored to our client organizations’ needs, Performex offers impactful development programs that transform technical managers into real leaders. Contact our team today to discuss winning strategies in today’s war for technical talent.